My independent Viva Survivor workshop has helped me a lot and it’s not even run yet. It’s got me making very quick progress with some ideas I’ve been considering. With workshops run through universities there is a limit to what can be provided to participants in three hours or via handouts. I knew that I wanted to give participants at the independent workshop my ebooks to supplement their learning, but I’m also a print enthusiast despite my Kindle addiction. 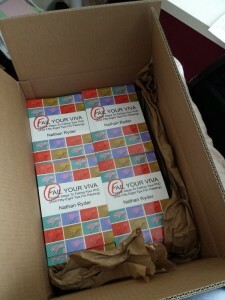 A print copy of Fail Your Viva, my first book, seemed like it would be a valuable resource as part of the participant pack. I’ve been thinking for a couple of months that I would like to expand into print with my books, and I’ve had some experience through other new ventures of producing print runs. Deciding to do the independent workshop pushed me to get it done, and push past any barriers, real or imagined. So here we are! It’s done, it’s here, it’s available: if you’re coming to the workshop, you’re going to get this as part of the resource pack (more on this in another post soon), but if you’re not able to come and want a great book on viva preparation then you can get one from here for £8.99 including postage and packaging. It’s coming directly from me to you, and I’ll post it out ASAP! Producing something of value for others is a part of why I do what I do. I want to help people, and I think that this book can help people prepare for the viva. The majority of reviewers for the Kindle edition think it’s good too! Want to know more? Feel free to drop me an email. I’ve listed the book including postage just in the UK, but if you live elsewhere in the world then message me and I’ll check postage rates. If you want more than one copy, or if you want a bulk order then let me know, I’m happy to explore options with you. Want to go to a workshop on viva preparation where you’ll get this book, ebooks and more resources AND a three hour primer on preparing for the viva and what to expect? Click here! And if you can, please share this with anyone preparing for their viva, who might be looking for help. Copyright © 2019 Nathan Ryder. All Rights Reserved. Designed by bavotasan.com.